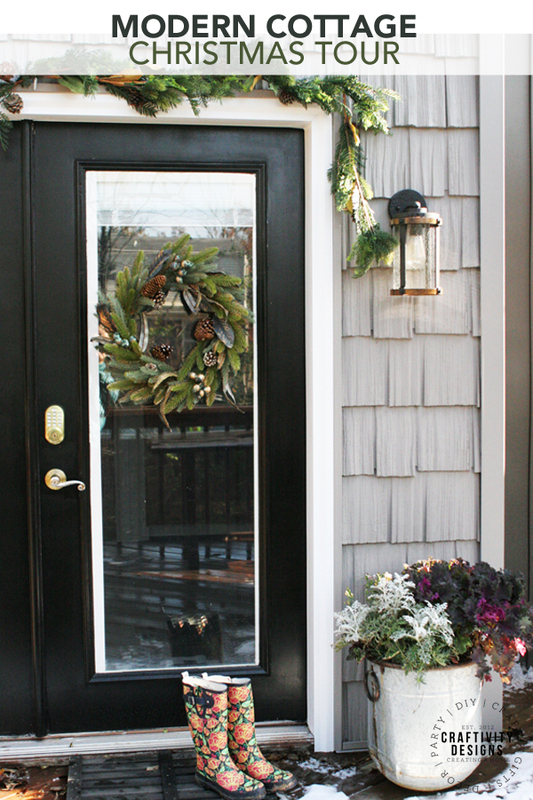 Take a Christmas Home Tour of our Modern Cottage. This Cottage Christmas Tour is filled with simple Christmas Decorating Ideas that are perfectly suited to the modern home. Does anyone else love Christmas decor but dread the work it takes to pull it off? That’s totally me. When I polled readers back in October, nearly half of the respondents preferred “Simple Christmas Decorating Ideas” over other seasonal blog content. So, it seems, I’m not the only busy person… who also likes a bit of Christmas cheer! 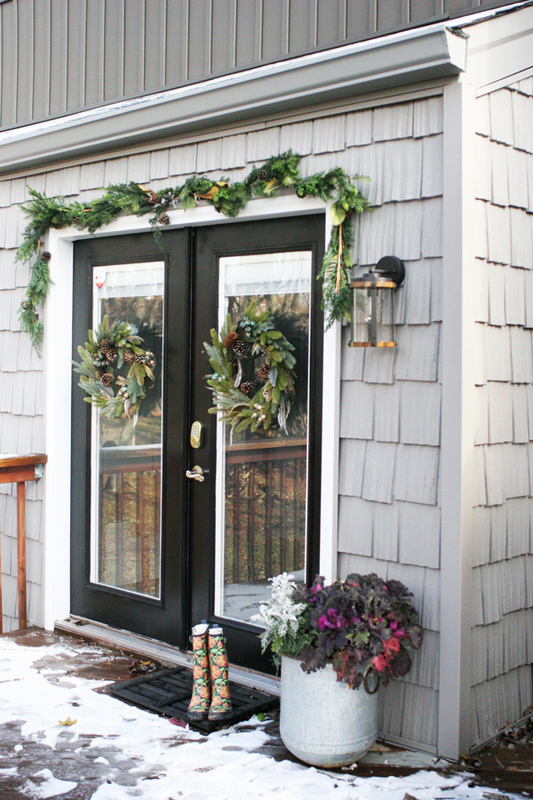 This year, I’m hoping to inspire you to decorate simply, with a Christmas Cottage Home Tour. Disclosure: This post has been partially sponsored by Amara. All opinions are my own. and modern design elements – such as clean lines, practical spaces, and eclectic decor. 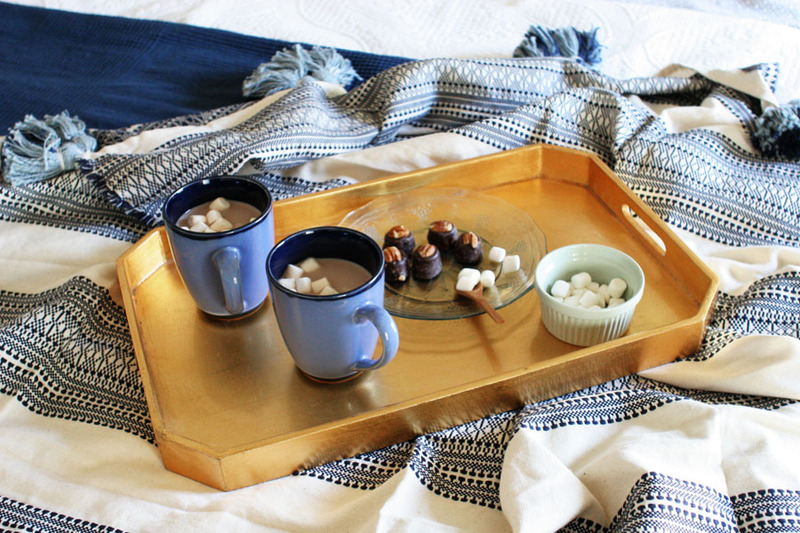 Our Cottage Christmas Home Tour is no exception — mixing modern and cozy all-in-one. I hope you love the tour and find some simple Christmas Decorating Ideas along the way. I can’t express how far this brick and siding home has come since March (here’s where it started). 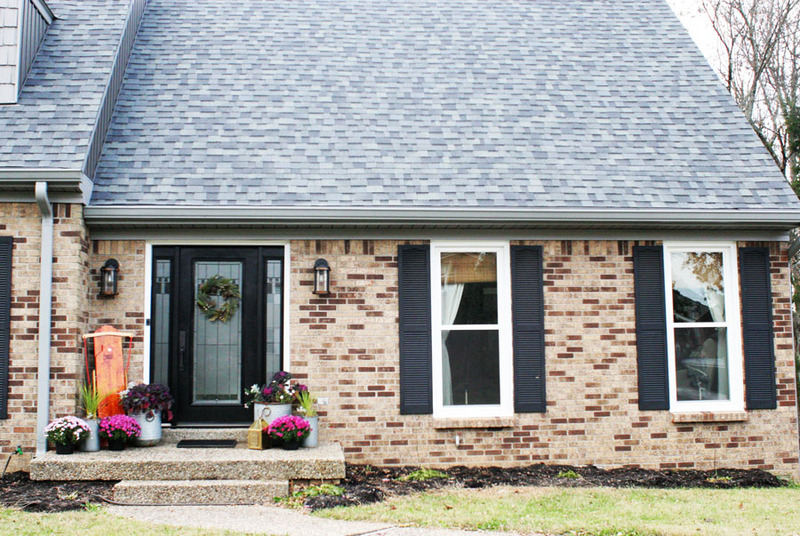 A new roof, replacement windows, and a combination of cedar shake with board and batten vinyl siding made a world of difference. 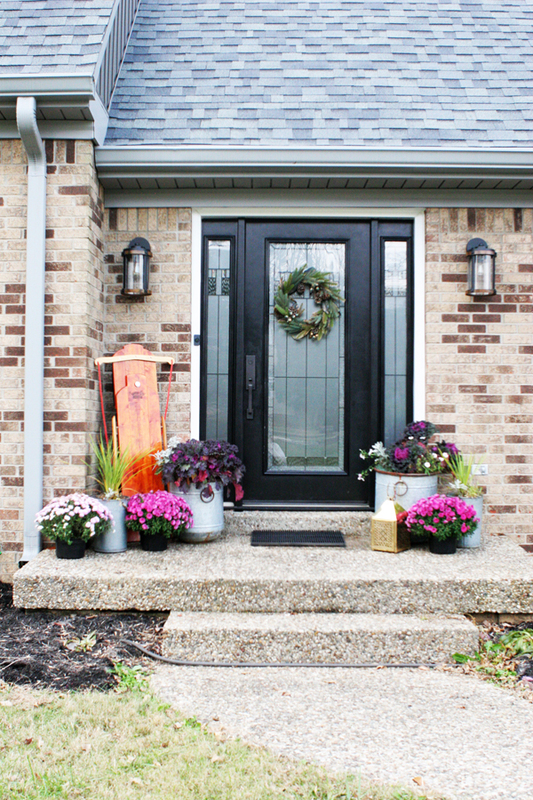 Then, finishing touches like a modern glass door and outdoor sconces finished off the front entry. 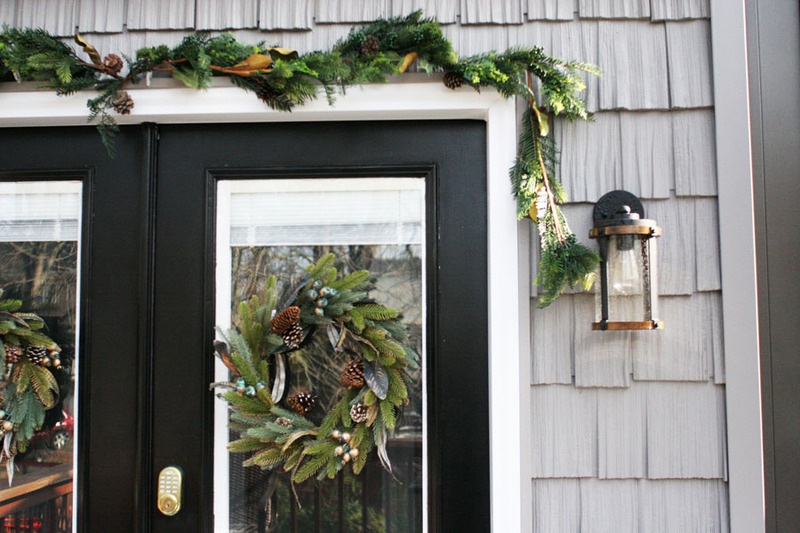 Of course, outdoor Christmas decorations aren’t complete without a wreath hung on the front door. That’s an easy place to start when it comes to Christmas decorating. Beyond that, I kept it low-key… a wooden sled leaned against the wall, a winter-friendly doormat, and a shiny brass lantern. We’ve had our first frost, but I pulled in the plants for the cold nights with hopes to squeeze in a few more weeks of their beautiful color. 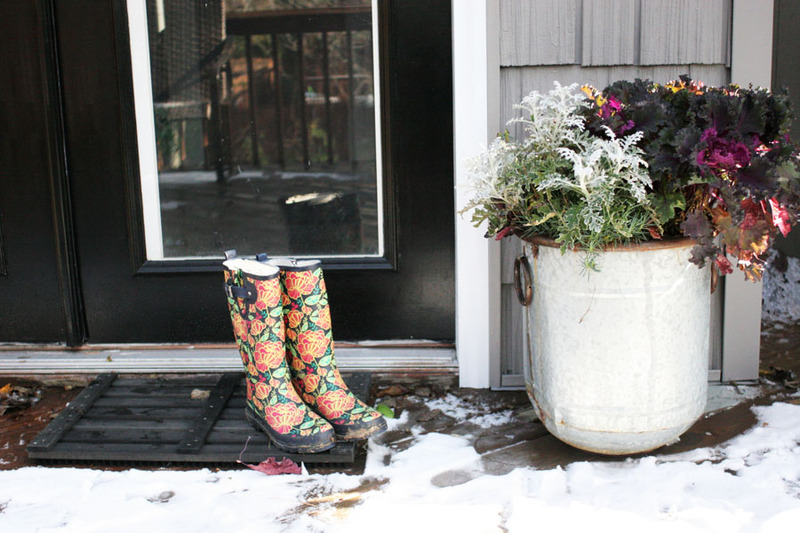 The tour of our Christmas Front Porch includes all the details of how we pulled together outdoor Christmas decorations in minutes (and how you can, too!). Again, check out the original home tour to see before photos of the living room. It’s far from complete, but applying a faux German Schmear to the brick fireplace was a great start (and quite easy, taking less than 3 hours total… hopefully, I’ll have the tutorial up in the next month). 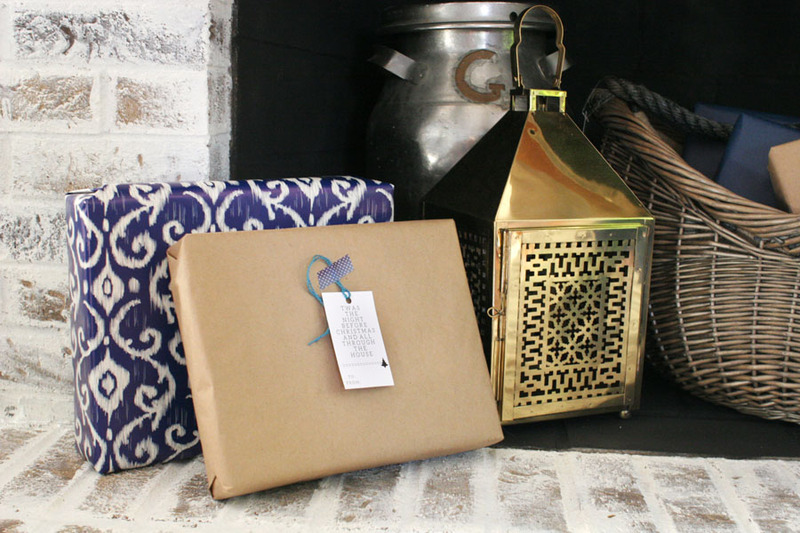 The fireplace is non-working, so I filled the firebox with wrapped presents (grab the free printable gift tags in this post), a basket, and a few metallic items to catch the light. 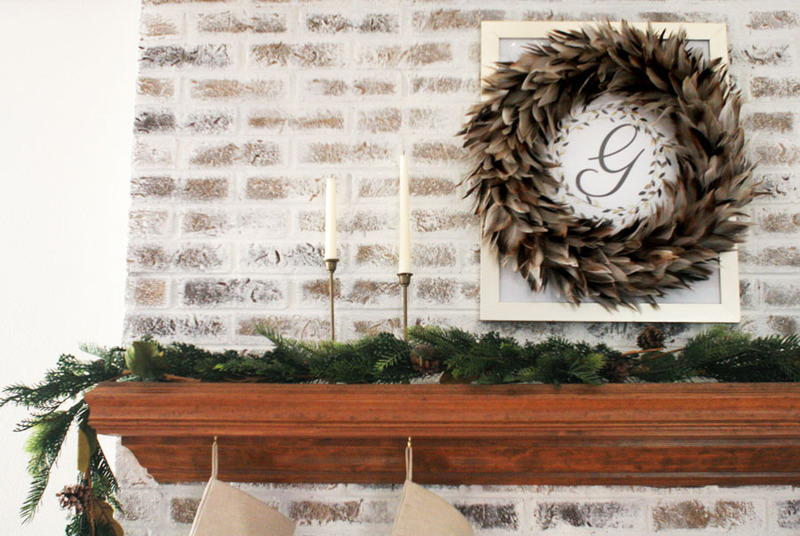 Atop the mantel, I hung a wreath over everyday artwork to make the art feel festive. Vintage brass candlesticks flank the frame and a couple strands of garland laid across the wood mantel complete the Cottage Christmas look. Tip: Skip decorative stocking hangers and screw cup hooks into the mantel, instead. It’s simple, clutter-free stocking hanging. Much of this “Christmas decor” easily transitions to winter decor since it’s not classic red and green. 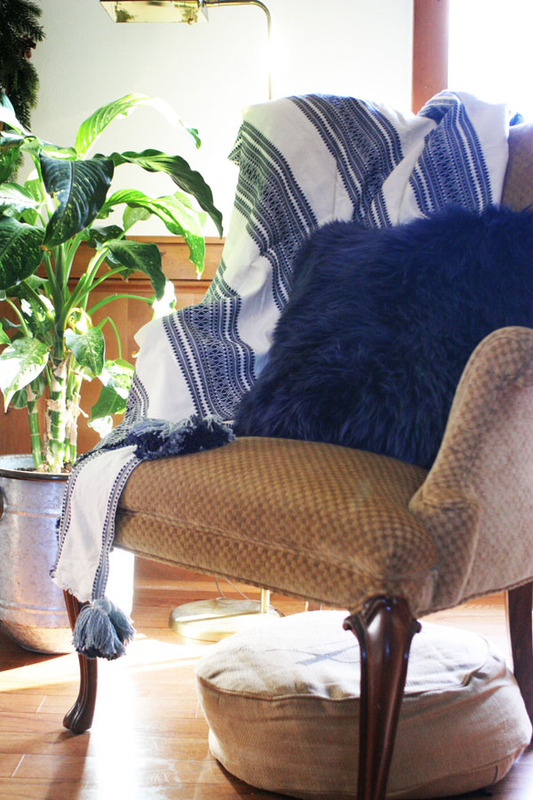 An eclectic throw, blue sheepskin pillows, and a feather wreath will last well into February while also adding luxurious texture and cozy warmth for the holidays. 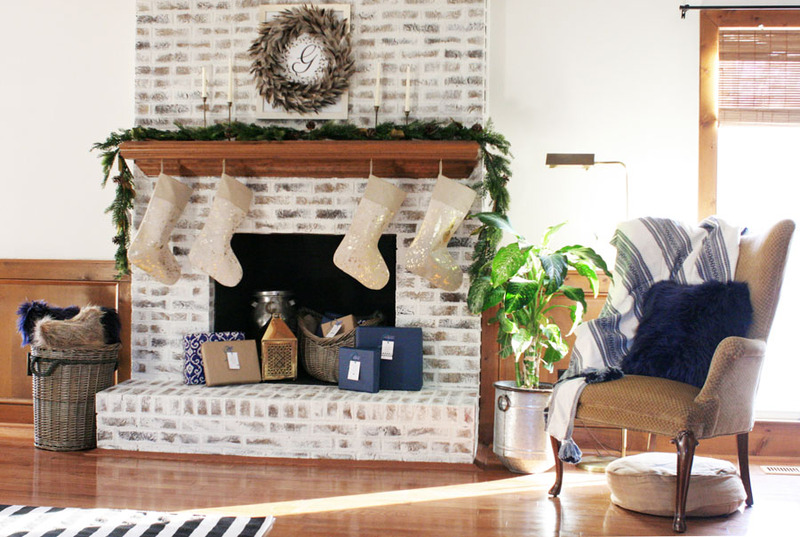 Would you like to see how I updated our last brick fireplace? Check out the brick fireplace in our last home. 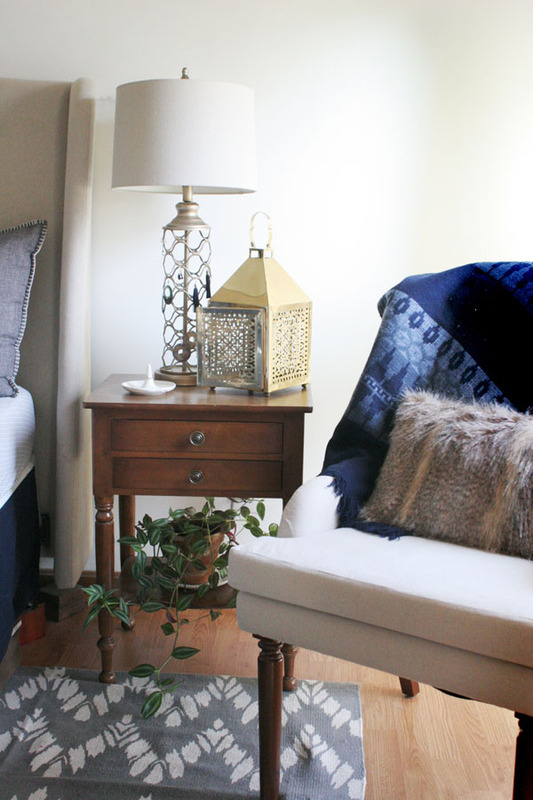 Outside of our furnishings and new window treatments, this room looks just as it did when we bought the home. The vaulted ceiling and wood beams make it quite stunning, on its own. 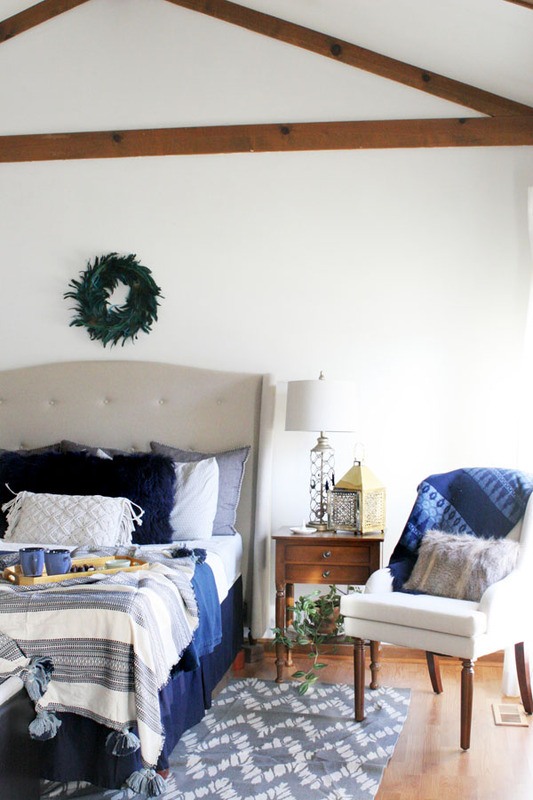 For the Christmas season, I swapped the art over the bed for a peacock feather wreath. 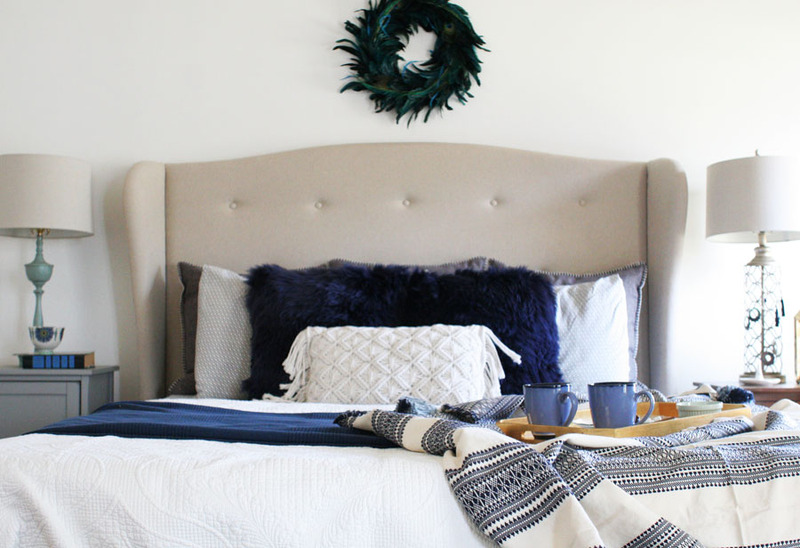 The rich jewel tones in the wreath echo the colors in the bedding. 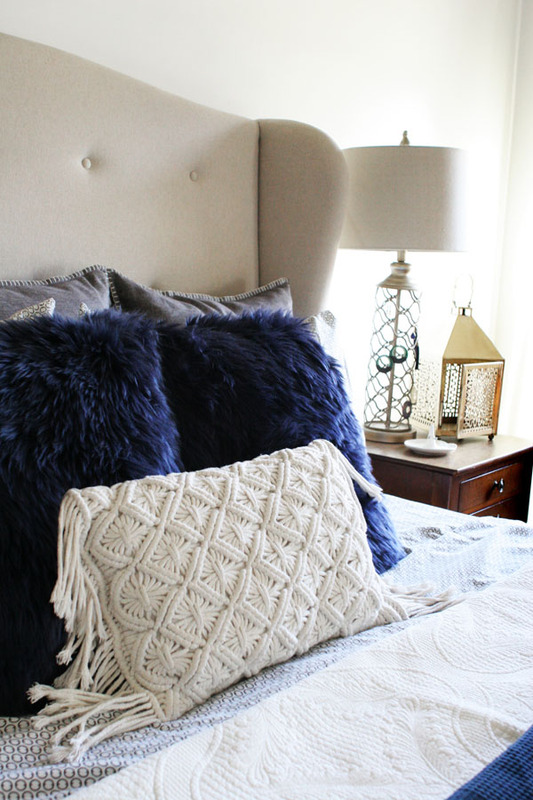 Like the living room, tons of layers (that is 4 rows of pillows, folks, much to my husband’s dismay…) add cozy warmth. 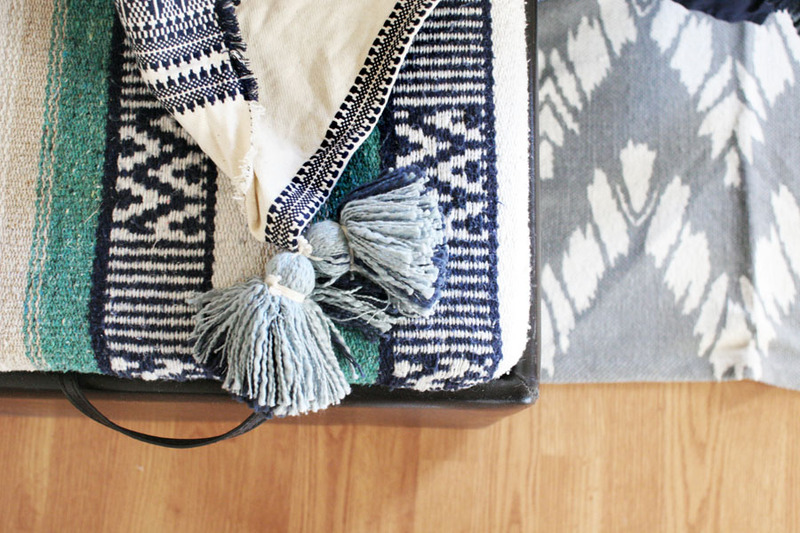 A mix of patterned throws, our rug, and upholstered bench are an eclectic mix which feels modern and festive. 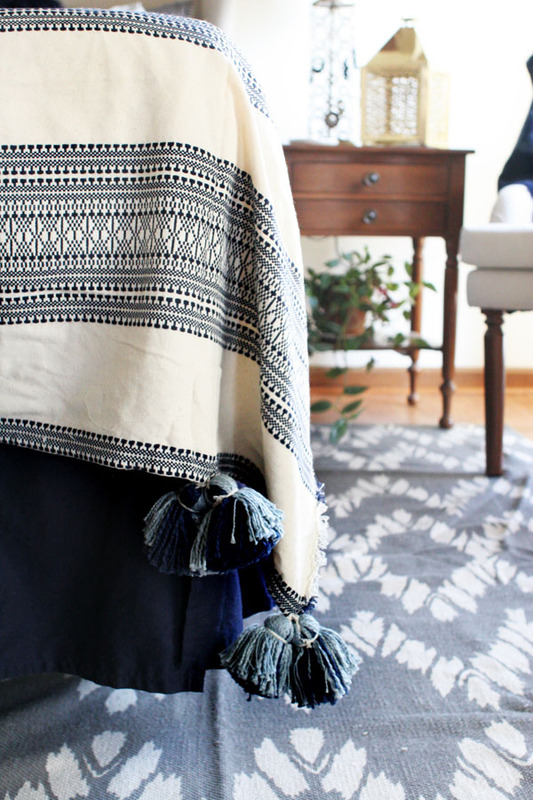 Keep it from feeling too crazy by choosing patterns within the same color palette. Finally… and probably my favorite “moment” in this space… it’s so easy. Simply drape classic green garland over a focal piece of furniture. 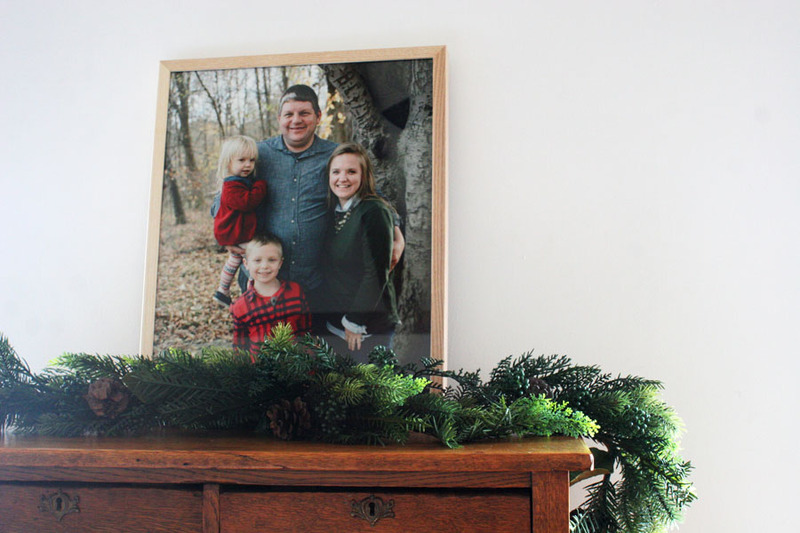 I chose our antique chest of drawers and added our family Christmas photo from last year, as well. Can you see why I love it? 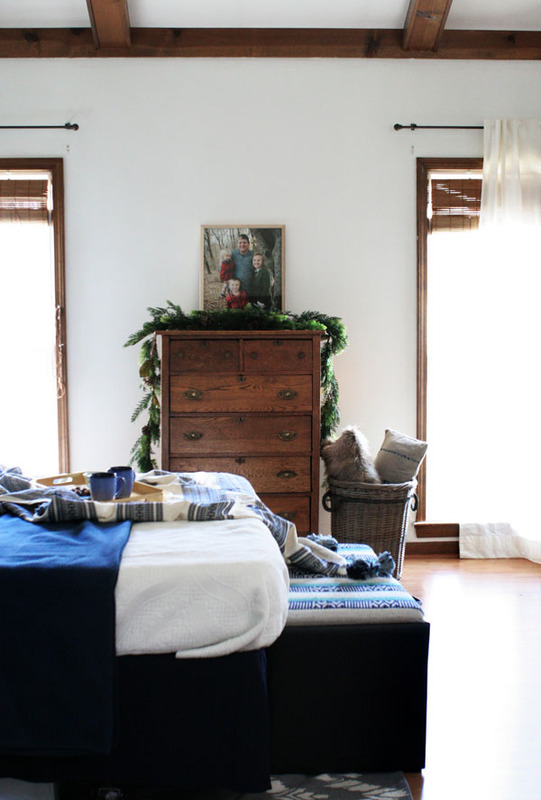 This photo is everything I love about a Cottage Christmas… wood beams, layered bedding, simple white curtains, touches of Christmas, and timeless antique furniture. Would you like to see many of these items in a different space? 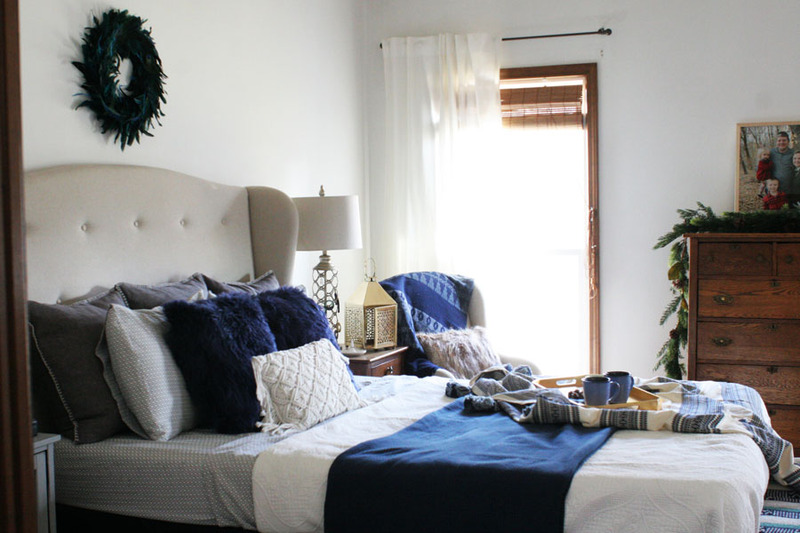 Check out the Navy Master Bedroom in our last home. Now, let’s step out onto the back patio. The siding exterior on the back of our home is actually the most dramatic transformation that we’ve completed (see the before here). From faded yellow vinyl to dark grey board and batten paired with a light gray cedar shake… we love how it turned out. 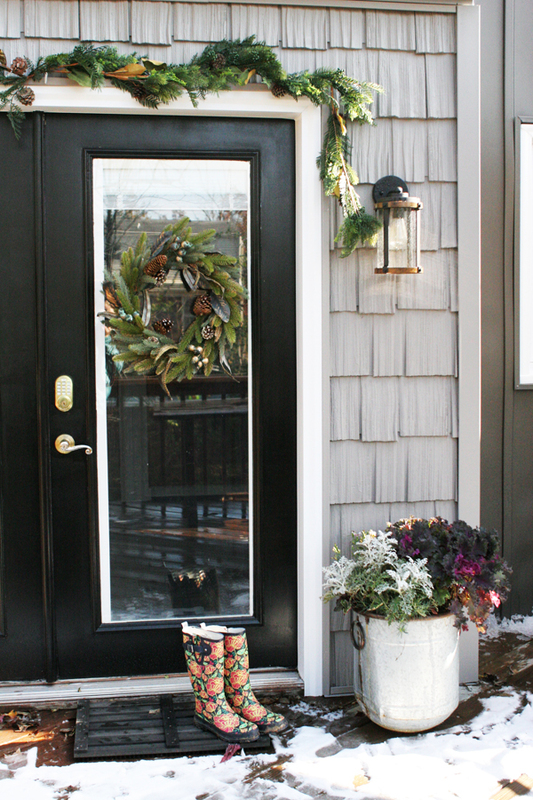 The back door received a fresh coat of paint and it looks stunning paired with wintery wreaths (and snow, ya’ll! In November!?). 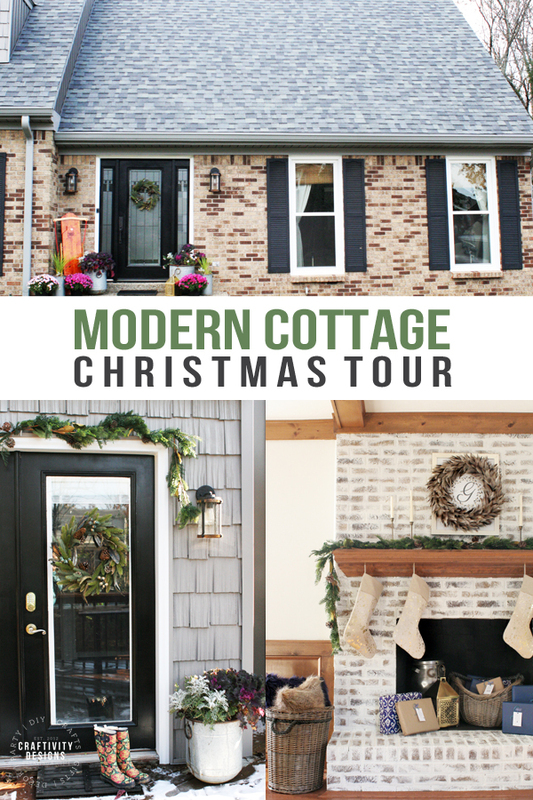 So, what do you think of our Cottage Christmas Tour? 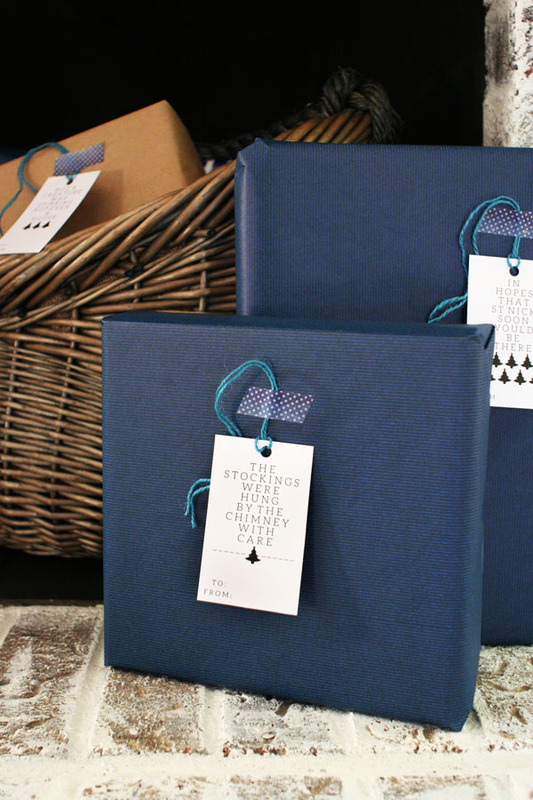 How will you decorate your home this Christmas? Stick to simple decorating ideas and alleviate some of the stress that can come with Christmas decor… so you can enjoy the true beauty of the holidays! 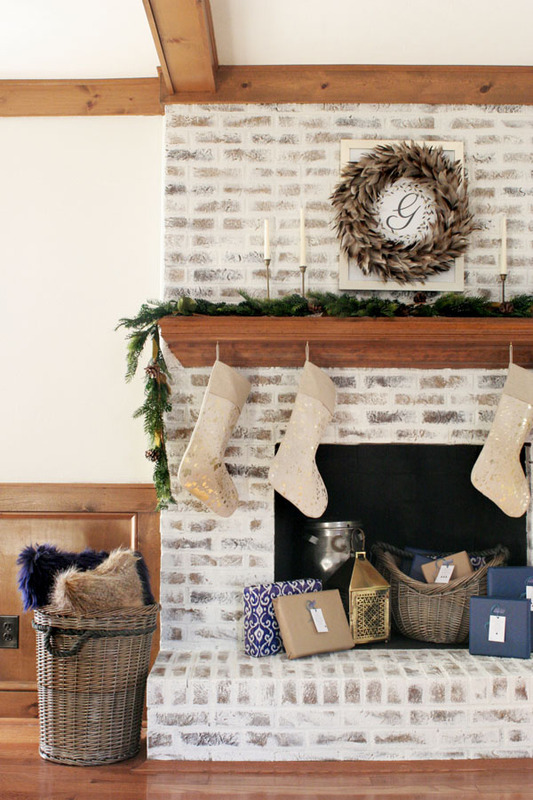 Take the Farmhouse Christmas Tour of our last home (plus, find links to 15 more farmhouse style homes decorated for Christmas). 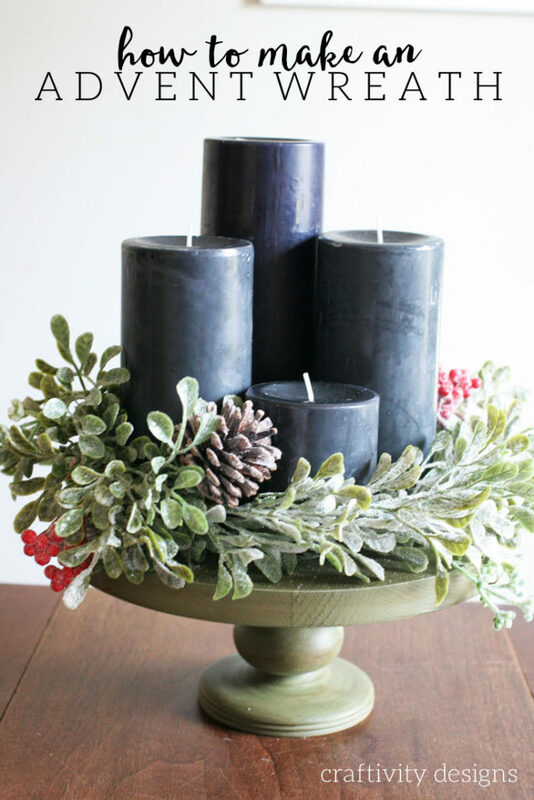 Learn how to make a stunning centerpiece with the tutorial for this DIY Advent Wreath.